10am-11pm Wed/Thu, 11am-12am Fri, 9am-12am Sat. Home of the Ohio State Fiddling Contest. 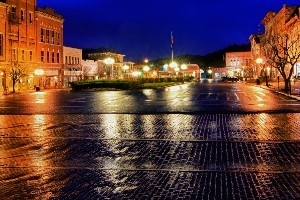 Held annually in August in Nelsonville in the historic Public Square - The Parade of The Hills has become one of the states premiere family festivals. You will be treated to great family entertainment, regional art and home cooking, concessions, midway, carnival, Pie Contest Auction, 5 K run, Kids Street Games, Kids Athletic Day, Parades, The Ohio State Fiddling Contest, and free nightly entertainment. We feature three parades beginning at 6PM; Wednesdays Welcome Home Parade, Thursdays Bicycle Parade and Saturdays Grand Parade. Wednesday, 8-15 - Sail On - Beach Boys Tribute Band. The Family Fun Park will feature Cirque Amongus - Education Enrichment through Circus Arts.